Dida Rios Castillo shows visitors her technique for smashing glass to get it ready for the next phase of recycling. NOSARA, Costa Rica – Dida Rios Castillo finds that smashing glass bottles relieves a great deal of stress. Hellen Rojas Porras enjoys knitting, teaching others and the camaraderie she shares with her nine female co-workers. Melissa Arrieta M. crafts beautiful baskets both large and small out of newsprint. These women are just three of the 10 who staff the Nosara Recycling Center. Tourists know Nosara as the beach-front community full of luxury hotels, Americanized restaurants, ideal surf spots and world-renowned yoga. But the actual Tico village of Nosara is located five miles inland. It is home to locals, a few typical restaurants, an airport landing strip, a pungent garbage dump and as of August 2013, the Nosara Recycling Center. The center was first posed as a design competition to students at the New York Institute of Technology (NYIT) in November 2011 by practicing architect and Assistant Professor of Architecture Tobias Holler. NYIT chose Nosara as the site because of the day-and-night divide between Playa Guiones with its white sand beach beaming with sunshine, swaying palm trees, and crashing waves, and the village of Nosara, overridden with trash and divided between foreigners and locals, many of whom lack education about the importance of recycling. Locals and tourists alike throw trash alongside roads, burn it in large piles, or dump it into the rivers, creating human health risks and environmental problems. The trash disposed alongside the road is an eyesore to what many consider one of the greenest countries in the world, and the practice of burning trash “releases hazardous air pollutants, particle pollution, and volatile compounds whose toxic fumes such as dioxin can enter the food chain and cause severe harm to water and surrounding vegetation by settling through the air,” according to the EPA. Alvaro Camacho, manager of the Nosara Recycling Center, blames this problem on a lack of education and the great divide between Ticos and “gringos,” as he said. This divide has been heightened by the American Project, a development tucked away by the beaches of Playa Guiones, Playa Pelada, and the surrounding hills. The idea behind the American Project is that large homes can be built alongside these beaches but owners can still feel complete isolation if desired. 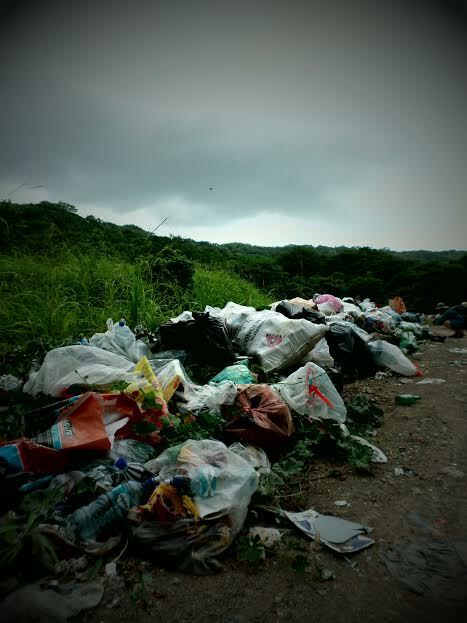 Tourists see the green, luscious side of Costa Rica while locals, including the many expatriates who make the area their home, must contend with a waste management problem they cannot seem to get a handle on. Camacho, a native Costa Rican from the hills of Heredia, found himself under the center’s giant beams in May 2013, just as the locally harvested wooden structure was nearing completion. Today he oversees the 10 single women from the small village who devote 35 hours each week to sorting recyclables, smashing glass and handcrafting jewelry, baskets and other creations using materials brought in for recycling. The center operates under the direction of a six-person board of directors elected in June. They live in Nosara but some are transplants from other countries. Board president Christoph Hubmann, originally from Switzerland, has been involved with recycling efforts in Costa Rica for many years and said the board members feel an obligation to give back to the community. The board meets every Tuesday to discuss news and plan events, such as weekly recycling pick-ups in the village of Nosara and informal coffee talks for members of the community to come and learn more about recycling. The center’s 10 employees along with Camacho and board members are in agreement that a lack of education about the importance of recycling is why the problem persists in Nosara. “Recycling is an educational process, and even just educating one more person per month is essentially creating change,” Camacho said. To increase awareness about the center and to educate the community, Camacho and his team visit every single home in the small community twice a month, every month, even if they have been turned away before. Camacho believes every person can help and by going door to door, it encourages people not to wait for the problem to be fixed but rather to do it themselves. Since the center has been in operation, Camacho has noted that about 80 percent of people bringing recyclables are foreigners while only 20 percent are locals. This trend exists, he thinks, because the center was built by a group of Americans and many Ticos in the village see it as just another “gringo project” they do not want to support, even though it would be to their benefit. 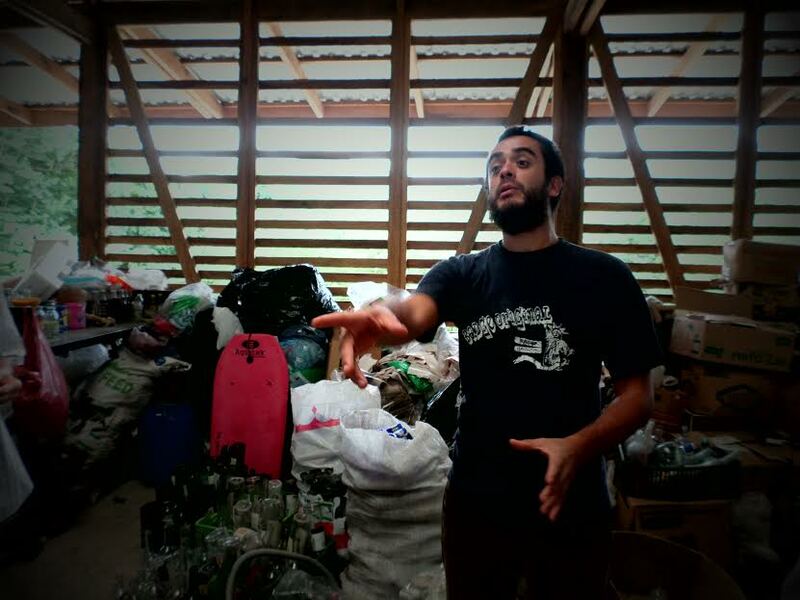 Manager Alvaro Camacho points out the importance of recycling to visitors. 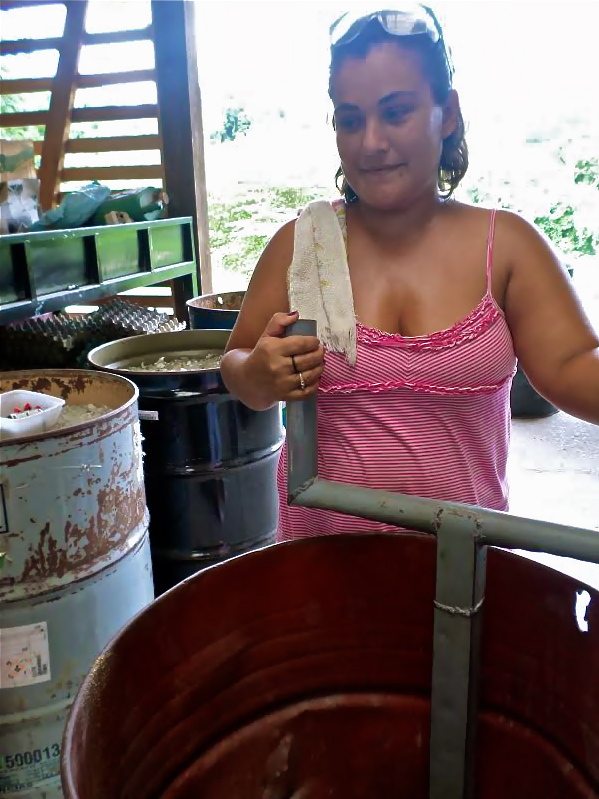 Camacho attributes much of the success of the Nosara Recycling Center to the single women who spend seven hours every day working at the center to lessen the impact of trash within their community. They sort the trash from recyclables, color-coordinate glass bottles, fill metal barrels, and organize the thousands of items that are dropped off there and prepared for distribution to the next step in the recycling process. Their main goal is “to raise awareness about recycling while showing people what it means to recycle properly,” Rios Castillo said. “It feels really good to be here. I feel at home,” said Rojas Porras. Rojas Porras and her coworkers have found common interests, such as knitting, and once they are caught up with preparing the recyclables, work on crafts such as making baskets from newsprint or aluminum beer-can earrings. The women make these crafts in an open space in between the large sorting area and small closet-like room where the crafts are stored. Crafting for these women is not only a hobby but a way to educate. By showing people what can be made from trash, they say, it encourages others to try it for themselves or to utilize the center so more crafts can be made. During high season these women sell their recycled crafts at a craft fair at La Iguana Hotel in Nosara. The hotel charges the center about 500 colones, less than one dollar, for the table where the women display their crafts. Seventy percent of the profit made from the crafts goes back to the women, who are paid $50 per week through government subsidies, and 30 percent goes back to the center to help purchase supplies such as glue for the crafts, water for workers and other necessities. On a humid August afternoon, four of the women were doing the rounds in town while the other six were working at the center. Having a role in educating their community is something they love, they said, and Rojas Porras commended her boss, Camacho, on his work ethic and care for others, reflecting the symbiotic relationship the employees share with one another and recycling as a whole. 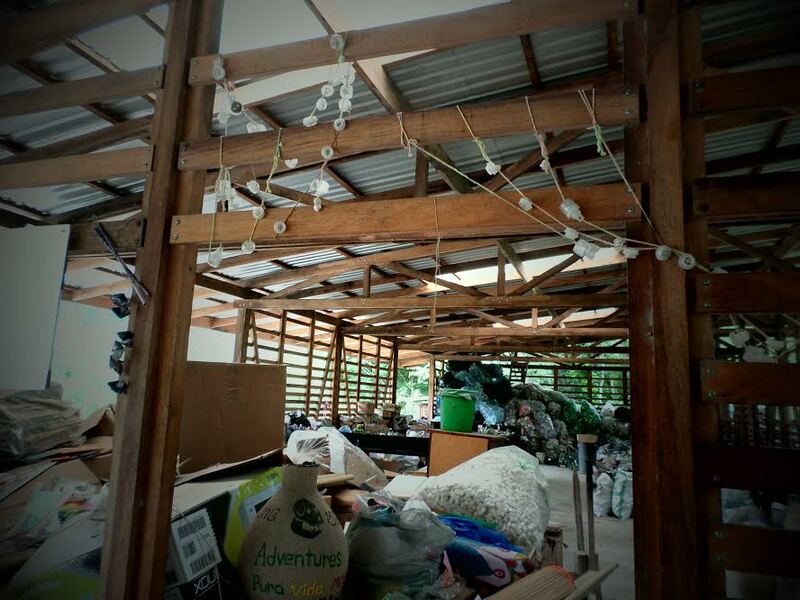 “The Nosara Recycling Center is more than a business, but rather a start-up for change, a push for education, and a move in the right direction,” Camacho said.